Everyone likes clean windows! It allows you to see the world outside and all around you. The last thing you want to be thinking while daydreaming out the window is how on earth those finger prints got on there. We know, we know, it can be super annoying. Many companies out there state "they can handle any window." But we take it further. We specialize in commercial businesses where other companies cannot compete. Everyone has that friend, co-worker or child that wants to act like the funny one and puts his/her lips on the window and blows their mouth up. It is pretty funny in the moment, but now your thinking - whose going to clean that? It's gross! The perpetrator of course will never be the one to clean it, so you try. Now it's smeared all over the window any looks nasty. Stop worrying and spending time after time washing the inside and outside of every window. That's why we are here. We take that hassle out of your life. We can clean windows like it's no one's business. 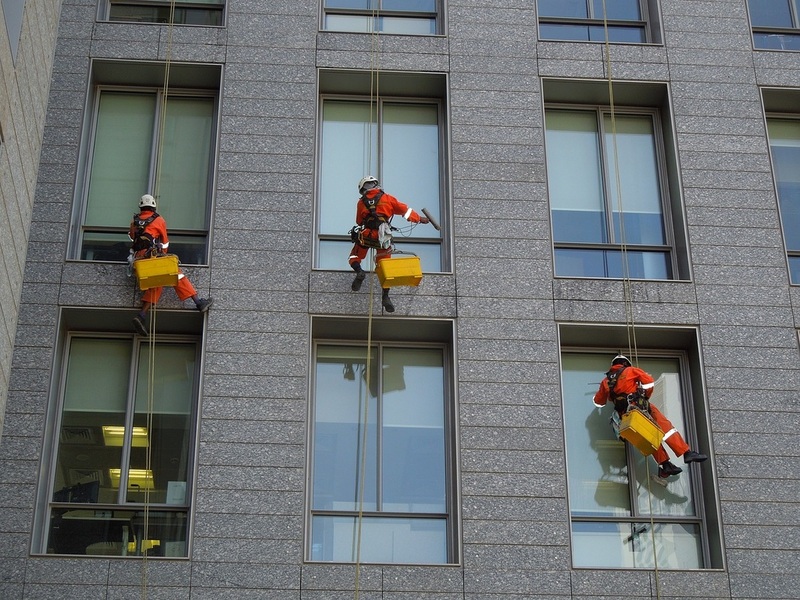 Ideally, commercial or residential windows should be cleaned twice a year. A lot has to deal with whether or not you’re living in an area where there is more dust than usual. If this is so, then the number of cleanings for windows should go up. Part of what makes window cleaning a serious chore for homeowners or office cleaners is the intricate design that allows dust to gather in the corners. Rubbing the windows is not always the best option when it comes too professional cleaning. Scrubbing means that you’re simply moving the dust around from one corner to another, which can attract more dust and make the window look dirtier than before. Here are some of the best ways to clean your windows as per professional and commercial cleaning services. Squirting soap into the bucket and then filling it with water can lead to development of useless suds. Fill the bucket with water and then give it a couple of quick squirts of your eco-friendly soap so the soap and water will mix perfectly. If suds are on top of the water, it will not help your cleaning process. Most people think that using green scrub pads that are used for cleaning dishes will also work well with the windows. This is not always the case. Stubborn window stains don’t always get clean with a green scrub. That is why we suggest the white scrubs, they are considered ideal for window cleaning. Green scrubs can add scratches on the surface of windows while the white scrubs gently clean off any dust and stains with ease. Scrub the windows in one direction and on the surface of the window. At the end of each stroke, lift the razor gently and then start onto the next section. If you go back and forth with the scraping process, it can cause further damage to the surface and result in permanent scratches. Cleaning windows in different seasons, especially in winter can get very tricky. Many window cleaning washer fluids are designed to specifically remove hard, winter stains from the windows. They can be mixed with regular cleaning solutions and added to some hot water. This will create the perfect mix for a cleaning solution that can be used for washing windows. It is best to keep extra paper towels in the slider to brush out debris and the glass areas on the edges without cutting up any of your fingers. Spray your window cleaning solution onto the stubborn stains and use paper towels to mop the remaining dirt and dust. It’s easier to effectively clean the glass like a pro with these simple and easy steps. With a few available tools and some basic technique, you can easily clean and keep your windows in their best shape throughout the year, regardless of the season. Our window washing skills and techniques are a forced to be reckoned with. No one has the staff and expertise to clean windows like our professionals do. Just ask anyone that has had our service done or written reviews for us. They stand by our abilities, and you should too!